Now while all this is super exciting, looking at Ontology’s price action may bum you out a little bit. Wednesday’s surge was the first bullish attack after weeks of consolidation. 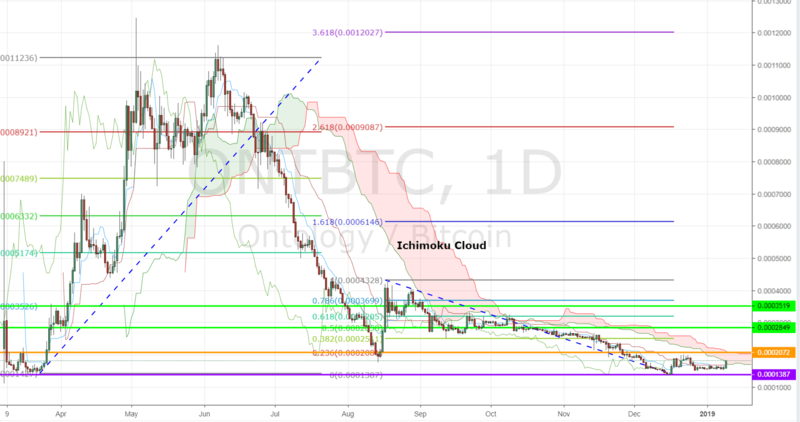 The ONT/BTC pair bottomed out on December 15th, when it reached the all-time-low level of back in March 2018 when it started out trading on Binance. By April it started surging like crazy. That’s when I predicted a correction. One good thing is that Wednesday’s bullish push brought the pair to the Ichimoku cloud and close to a key pivot level where I’m showing in orange on the chart. This level acted as key support back in August. This means if the pair is able to break above it and cross over the Ichimoku cloud, then we might have a case for a real bullish reversal.